IIC slave interface and HDMI DDC interface are available for debug and firmware update. Chrontel’s CH7101B is a low-cost, low-power semiconductor device that consists of HDMI receiver, three separate 9-bit video Digital-to-Analog Converters (DACs) and audio encoder, which can convert HDMI signals into VGA outputs at a maximum conversion rate of 200 MHz with IIS or SPDIF audio output. The HDMI Receiver integrated is compliant with HDMI 1.4b. The DACs are based on current source architecture. And the VGA output meet VESA VSIS v1r2 clock jitter target. With sophisticated MCU and the on-chip flash, CH7101B supports auto-boot and EDID buffer. 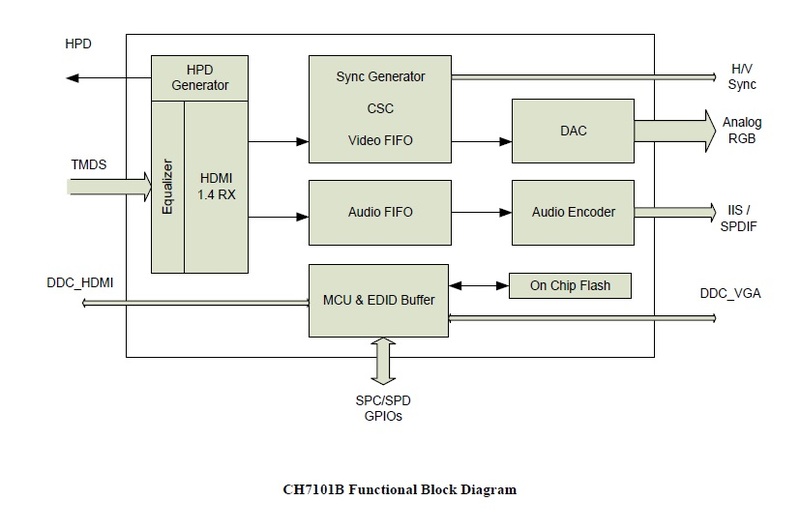 Leveraging the firmware auto loaded from the embedded flash, CH7101B can support HDMI input detection, DAC connection detection and determine to enter into Power saving mode automatically.